My most current room and the main room I've been using for the past 5 years still remains uncompleted. Every time I think I'm going to finish it, I blink and another year has passed. So rather than waiting forever, I thought I'd just dig out some old photos and give those who've not been here an idea what the room is like. Aprox 17 x 27 with a cathedral ceiling it has been designed to take advantage of every opportunity... remember this was an empty steel pole barn when I started. That's basically 4 x 6 posts with 2 x 6 horizontal nailers every 2 feet with steel siding screwed to it. Holly crap.... In my case, we added dense foil faced 1 inch foam to the entire building and taped all the seams to make it air tight before the steel siding went on. After that was done, a train car of 1 inch high density particle board with vinyl face went on the inside creating an air space between the foam board and the heavy particle board of 1.5 inches. 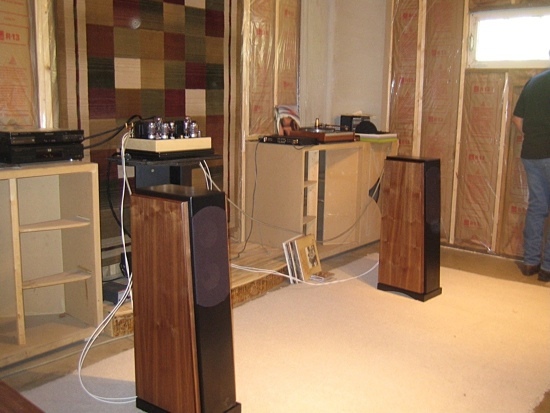 The particle board was used to manufacture Cerwin Vega Loudspeakers. 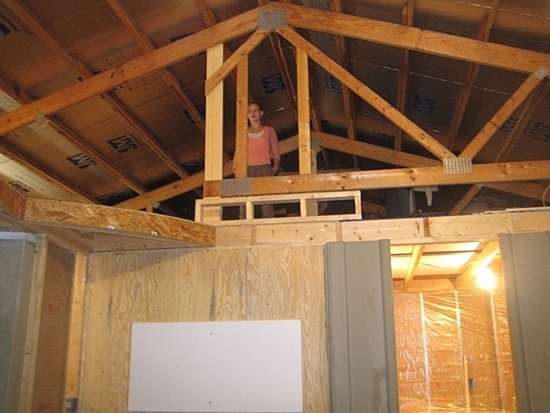 The 1 inch panels were 5 feet wide and 8 feet tall and were basically floated. This allows them to vibrate passing the bass easily to the foam and from there out into the yard where it never comes back. 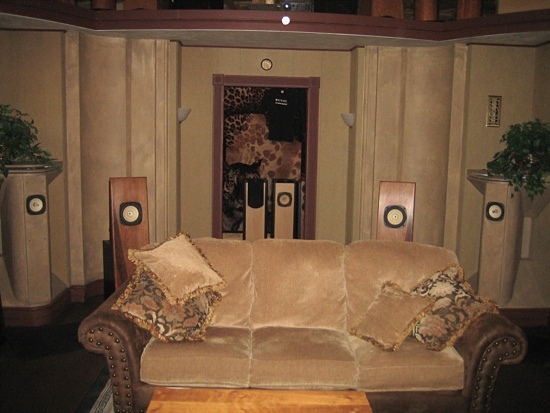 From there the listening room was studded out and insulated inside this structure leaving an 18 inch air space behind the front wall. Two Imperial 28 cubic foot folded horns are free floating in the corners but actually away from the "true" walls enough to eliminate any coupling. The walls of the room are floated around the Imperial cabinets so that nothing touches them. The corners of the room were moulded so there are no square corners. 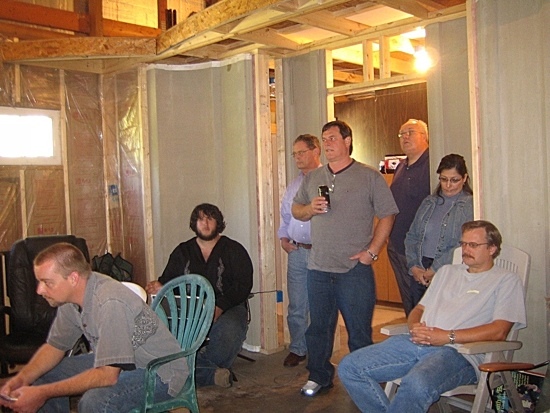 The room was then drywalled with 5/8 inch drywall and then 1/2 inch fiberboard was 100% glued to the drywall with a v-notch trowel. These wall are just dead, and... ring proof. 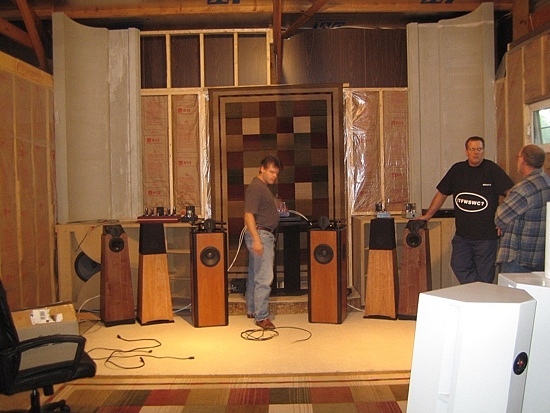 The room also opens up to the rest of the shop in many strategic ways so that sound flows throughout the building making working anywhere in here a sonically pleasing experience as we listen to music ALL DAY and NIGHT. This is a shop that is never silent. 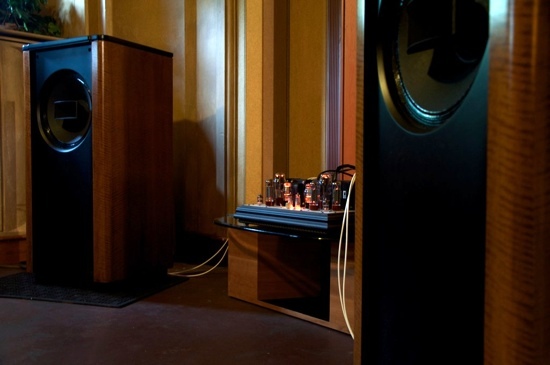 Every night amps are breaking-in on real music at normal listening levels. 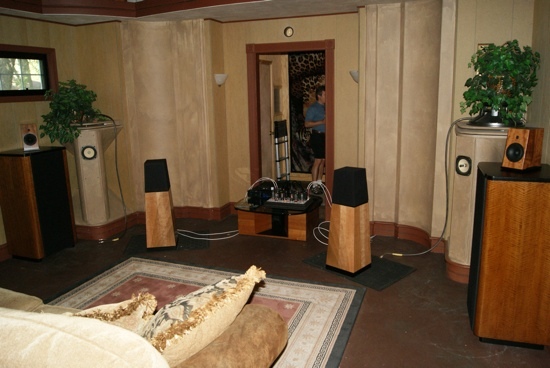 The biggest issue with any room is bass. I designed this space and the walls to trap and release energy like a one way valve. All of the walls are like bass diodes. Consequently experiencing 20 cycle notes in here is effortless and without problems. 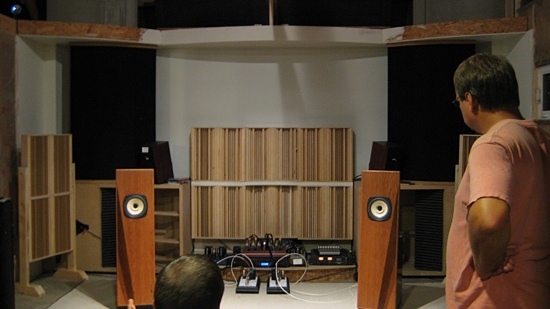 The room is designed with two listening ends. You can flip from one to the other, or do both at the same time as is the case when we watch movies or just want to kick things up a level. 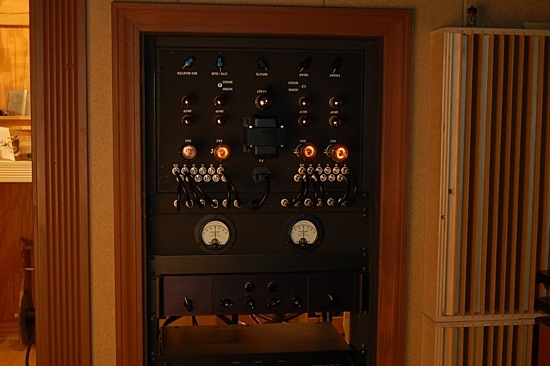 The end with the Imperial horns has a 6 foot platform between the cabinets for audio gear and my turntable. 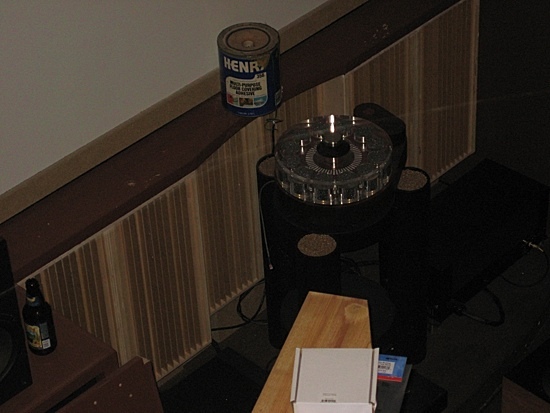 A concrete slab ensures no vibration finds the 57 lb turntable platter. Above the horn cabinets that lay on their side, is the movie screen with plush drapes that are closed during two channel listening. On either side of the screen are my full range Electrostats with the panels direct coupled to servo-charged tube amplifiers. 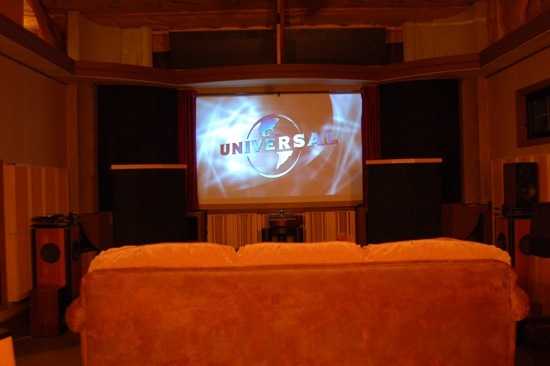 Above the screen are a pair of magnapans that can be used for center channel support during movies when and if anyone wants to go upstairs and watch the movie from the balcony. I use the electrostats for movies and pull them down on the floor into the room when I want to do serious 2 channel listening with them. In this rather poor picture are another pair of Accoustats that I've been rebuilding some custom amps for. 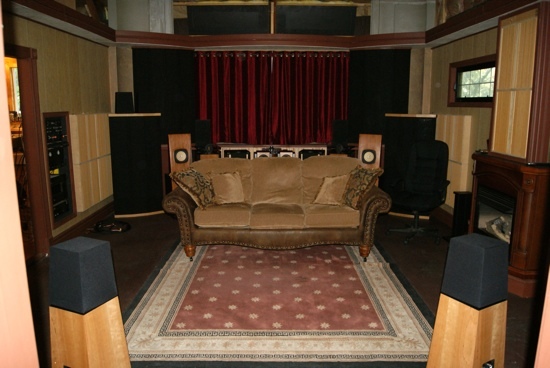 A lot of the room is run from an in-wall rack being controlled by the Zen Ultra multi-channel preamp. 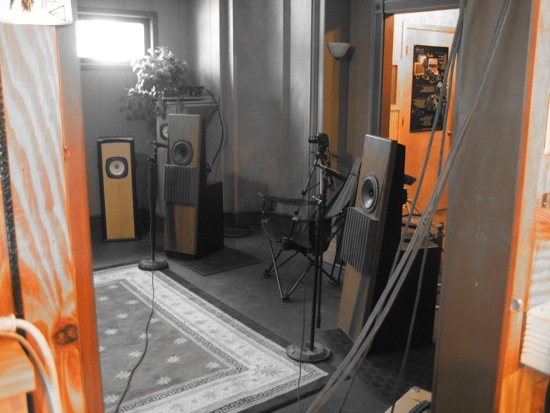 The other end of the room is multi-depth to assist sound stage depth with minimal diffusion. A poor image of the turntable taken from upstairs with a zoom lens. 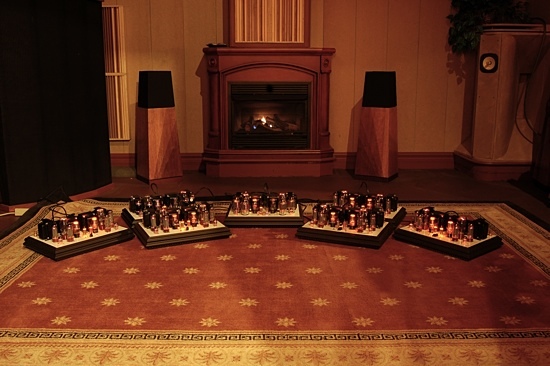 The room could also be used sideways, but I doubt this many amps would be needed. This was by far the part I'll never do again.... 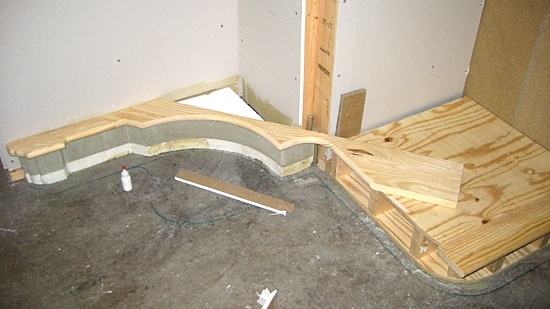 I cussed myself for the entire week it took me to build the curved walls and baseboards. So there you have it... eventually I'll finish it and write a paper on the results... until then, it sounds so good the motivation hasn't been overwhelming so no real hurry. 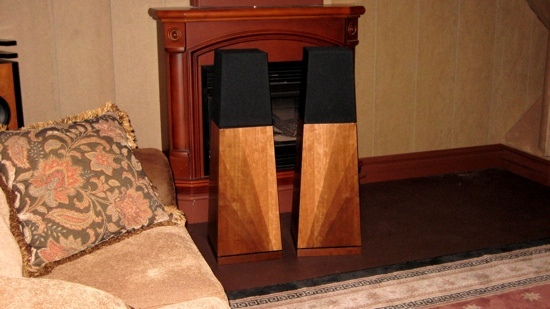 Good sound arrangements...Liked the different speakers used at places! !